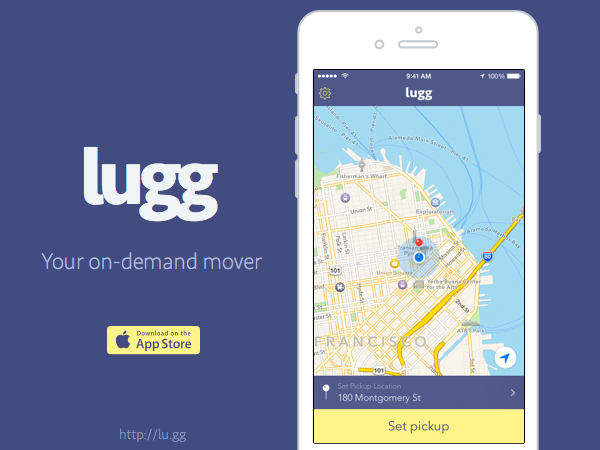 A new startup called Lugg is a mobile app that’s basically like having a friend with a truck who’s available at any time for on-demand, small moves. Recently launched in the San Francisco Bay Area, Lugg offers customers an easy way to haul things – like your IKEA purchases, for example, or it can help you move a sofa you bought on Craigslist across town. Basically, Lugg can move anything that fits in the back of a pickup or box truck. To use the app, you enter in the item’s location, the destination, and you snap a photo of the item to be moved. Lugg then connects you with an available mover immediately. The mover shows up within 15 to 45 minutes to pick up the item and take it to its final destination. All the payment, including tip, is handled within the application, similar to something like Lyft or Uber. Lugg is currently charging a $35 base fare, plus $2.50 per mile, and $0.50 per minute of travel time. On average, this works out to $40 to $65 per move, the company has found. At the high-end – like going from San Francisco to Oakland, for instance – the price might be more like $79. The company has cargo insurance, in case things go wrong. Lugg drivers keep 80% of the fare, with the remaining portion returned to the company. The idea for Lugg comes from Jordan Brown, who previously worked at a healthcare startup in Salt Lake City, where he encountered the problem first-hand. Without access to a big enough vehicle, he couldn’t get his furniture purchases home. Brown spent a few months coding the app, then moved out to San Francisco and slept on a friend’s floor to launch it. Brown brought on co-founders Steve Zerneri, previously an operations manager at Uber, and engineer Eric Kreutzer, to help out. Lugg is now onboarding more people with trucks to help meet demand. Like Lyft, anyone with access to a truck can sign up to drive for Lugg, provided they’re physically able to do the work which can involve moving heavy items. Two people are assigned to each truck, and they can toggle on or off their availability, allowing them to set their own schedules. Drivers are sent on a couple of test moves at first, to determine if they can handle working for Lugg. Brown says already a few people have quit their former jobs with other local moving companies to go to Lugg, because they didn’t want to have to work set hours. The plan is not to scale up the size of the moves or the distance traveled, but to remain small and regional, in order to not compete with local and long-distance moving companies. Lugg’s long-term goal, says Brown, is to be live in all major metro regions across the country. He’s already planning to expand to New York next, with an expectation of being able to reach that city sometime in the second half of 2015. Lugg, only a team of three full-time, is currently bootstrapping, but is in discussions with investors. The app is available as a free download on iTunes, and the Android version will be available shortly.